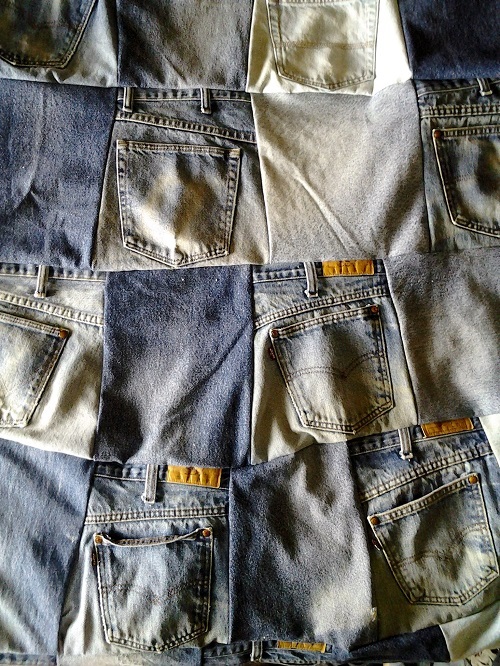 This is a blue jean quilt that I made using a stack of used jeans that someone gave me to play with. It's now become a quilt that the kids use for playing with. There is always something new stashed in the pockets. Has anyone else made this type of quilt? If you need help with directions I can walk you through it. Also I was wondering about ideas for using the left over denim for this project. I got a pile of it waiting to be worked with. That is a perfect kids quilt. Thanks for sharing. Thank you. Who would have thought that a Brother embroidery/sewing machine would be so durable! Such a cute idea! So many pockets to hide stuff in. Definitely better check your pockets before you wash that quilt! I bet some of that was hard to stitch - like through the waistbands of the jeans. I'm thinking the grands will have a lot of fun with this quilt! Stitching wasn't a problem. My sewing machine went through it like butter. Unfortunately, I had to cut all the jeans with just pinking shears because I didn't have a pinking blade for my rotary cutter. My hand hurt so bad I could hardly move it for 2 weeks. Next time I'll get the blade. It's more affordable than a bruised hand.